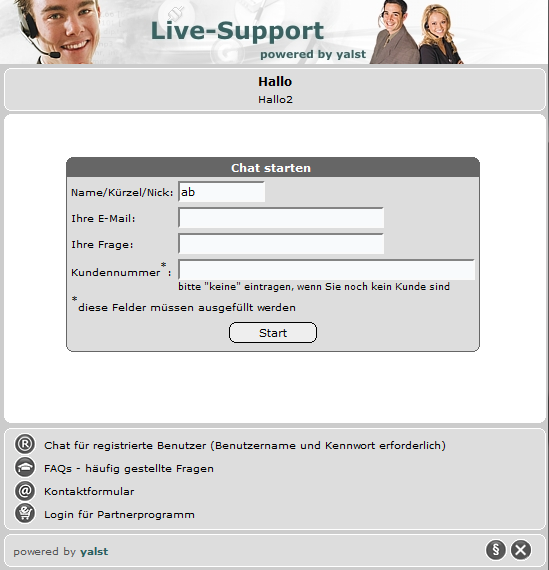 This document gives a general overview of the yalst Live Chat. The yalst user manual goes into the most important aspects of this software, starting from the various configuration options in the Administration and the Operator-Console to the different integration possibilities in your website. In this document we have put together all the features of the yalst-LiveSupportTool. 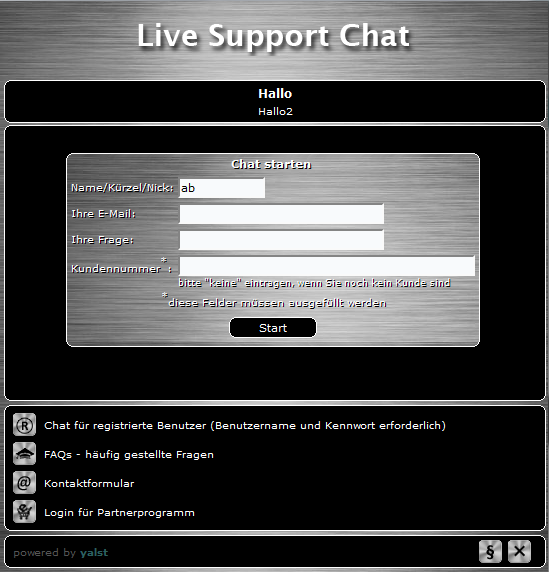 The chat API (application programming interface) allows you develop a chat client for the visitor’s side of the yalst LiveSupportTool. It provides all the necessary functions to start, carry out and terminate a chat with an operator from any yalst site. The Statistics API (application programming interface) allows you to retrieve statistical data regarding your yalst site from the system. The Administrator API (application programming interface) allows you to create or edit customers and to create or edit yalst instances. It can be used to automate the creation of yalst customers and packages on your server. Chat transcripts can be exported automatically as an e-mail or they can be pushed to an server-side script via HTTP or HTTPS for further processing. That’s explained in this documentation in detail. The Visitor API library enables a public application interface (API) for accessing and integrating the visitor-facing side of the yalst live support system in web pages. The Visitor API is not intended for communication between the visitor and the support agent but to provide a program interface for all steps in order to prepare and initiate such communication. A Theme for yalst-LiveSupportTool is a text file in XML format, in which the design of the visitor-facing side windows can be adapted and changed as desired. This documentation describes the structure of the theme file and the basic creation procedure. 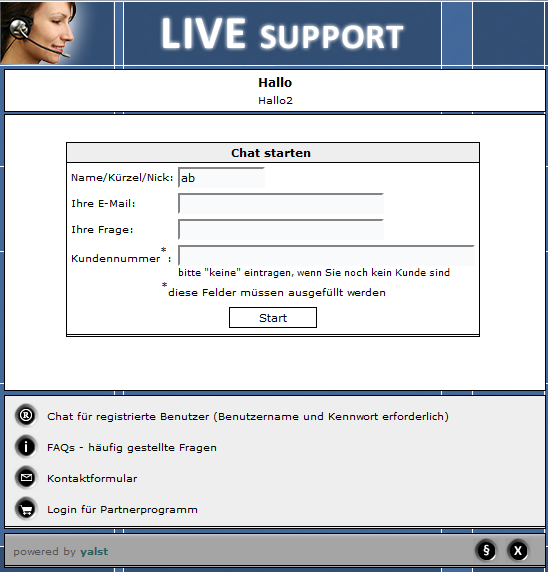 In this document the installation of the download version of the yalst-LiveSupportTools is explained. If you want to upgrade from any older versions to the current one of the download version of our software, the corresponding steps are explained in this document. This is the general license agreement for the yalst-LiveSupportTool, if you use the version hosted by Visisoft. These regulate the scope of your rights to use our software. This is the general license agreement for the yalst-LiveSupportTool, if you host the software yourself. These regulate the scope of your rights to use our software.